Collaborative law in Westport Connecticut can tackle many of the concepts at issue during a separation that the parties may not initially agree on, such as property division, child custody or child or spousal support. Collaborative law in Westport Connecticut seeks to get the parties to work together to reach an amicable decision about the legal issues that they are dealing with. A judge does not know the unique dynamics of the relationship between the parties and as a family unit, and can never know these individuals as well as they know themselves. As such, individuals who are able to set aside their differences are in the best position to make decisions about their own futures instead of leaving these decisions up to a judge. Collaborative law allows the parties to minimize the negative impact of divorce on both a financial and emotional level. The parties can have the same amount of power as each other in collaborative law without either one having to feel victimized during the process. Each spouse has an equal say during negotiations. The parties approach their divorce from a cooperative standpoint to work out an out-of-court agreement. By being part of the solution, the parties are often able to reach an agreement that they are happy with and that allows them to move on. Divorce can be extremely expensive when issues are hotly contested. When lawyers must fight for their client’s position, engage in contested discovery battles, and log many hours on the case, costs increase. Collaborative law can help minimize the cost and time by involving lawyers who sign a contract with the parties that binds all to work together to reach agreement, and if the parties choose to litigate, those lawyers must bow out – so all have incentive to resolve the matter. 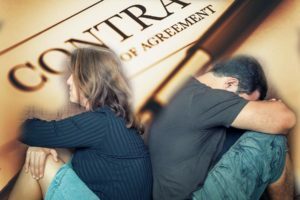 What Separates Legal Separation in Shelton CT from DivorceHow Can a Divorce Mediator in Westport CT Help You?